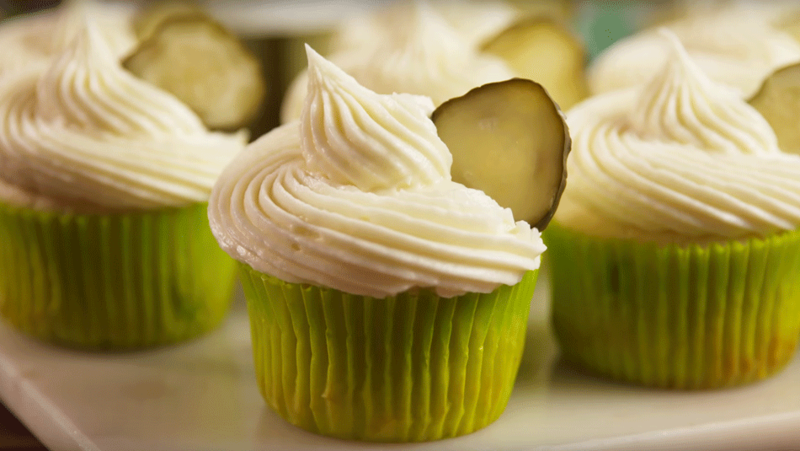 Would You Ever Try These Pickle Cupcakes? Are pickles having a moment? From pickleback shots with dill pickle vodka to Wal-Mart selling Tropickles, they seem to be everywhere this year. You can even buy pickle juice soda to quench your thirst, or make like a pregnant woman and smother pickles in peanut butter to satisfy a craving. First there were ice cream cupcakes, and now there are dill pickle cupcakes. When we ran into a recipe for pickle cupcakes, we were skeptical until we saw that the secret ingredient is bourbon. Can they really be that good? Would you try pickle cupcakes? If you want to make them at home, Delish has a great-looking recipe for them. We figure that we might as well start with a recipe that includes bourbon to start, just in case, because bourbon fixes most things. Here's the recipe, courtesy of Delish. For the cupcake ingredients, you'll need all-purpose flour, baking powder, kosher salt, butter, sugar, sour cream, eggs, pickle juice, and chopped pickles. The juice is enough to gather from a pickle jar, so make sure you keep any extra. It's also delicious to drink. Why have a normal cupcake when you can have a pickle one? If you're making a huge batch of these babies for a holiday party or a baby shower, it's best to buy pickle juice by the gallon, and we love this Texas-born-and-bred brand you can find on Amazon.com. For the icing, which is always the best part, you'll make a cream cheese icing with butter, cream cheese, powdered sugar, bourbon, and salt. Don't forget your pickle slices to garnish your neat little pickle desserts. You could swap in a vanilla buttercream recipe if you don't want a cream cheese-based one, though the sour cream probably adds depth to the pickle juice. It provides a good fat content to pair with the vinegar-like taste. Delish doesn't recommend this, but we suggest swigging some of that bourbon before your first bite. Unless you're making this to satisfy a weird pregnancy craving, in which case it's best to avoid the alcohol.